One of the aims of this blog is to facilitate understanding about both new religions and world religions. Before anyone can say they disagree with a given religion's beliefs or practices, or before we can even share their own faith appropriately, we must have a basic and fair understanding of other religions. This is most definitely the case in our ever-shrinking world where pluralism and globalization are significant social and cultural forces, where many of the world's conflicts reflect ongoing religious tensions often fueled by stereotypes, and where America's neighborhoods now reflect an increasing diversity of religious expression. And yet, while the need for religious understanding has never been greater, apparently religious illiteracy is rampant in America. 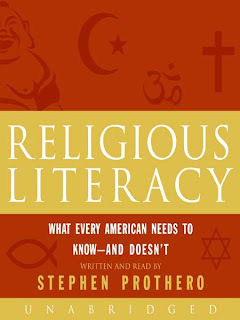 This is the claim made by Dr. Stephen Prothero, Chair of the Department of Religion at Boston University, and author of Religious Literacy: What Every American Needs to Know - and Doesn't (HarperOne, 2007). This book has been nominated for several awards, and remained on the New York Times bestseller list for three weeks. In this volume, Dr. Prothero has pointed out a deficiency in American thinking, with devastating local and international ramifications. He has consented to answer a few questions for this blog's readers. Morehead's Musings: Dr. Prothero, given the name places in national media in which you've given interviews, thank you for making time to share your thoughts with my readers in a much smaller reading audience. To begin, what drew your attention to America's illiteracy in terms of understanding of religion? Stephen Prothero: I think I got hit here from a lot of different angles, but one of the hardest hits was from my students. I've been teaching for about 15 years, and recently I finally realized that I just couldn't assume that they knew what I meant when I referred to Matthew (Matthew Perry?) or a variety of Bible characters and stories. So I started quizzing my incoming students on very, very basic information about Christianity and the world's religions. And I found that they did quite poorly. In fact, only about one in six passed my exam, which asked such simple questions as, "Name the first five books of the Bible" or "Name one Hindu scripture." Morehead's Musings: Can you give us some examples of this problem? You found great ignorance concerning even the dominant religion in the U.S., that of Christianity, even among Christians, but you also found that this lack of awareness involves religions across the board, isn't this correct? Stephen Prothero: Americans know shockingly little about Christianity, Judaism, and the Bible, yes. Most cannot name even ONE of the four Gospels. Most don't know that Genesis is the first book of the Hebrew Bible. And one in ten think Joan of Arc was Noah's wife. But things are even more grim when it comes to religions outside the Judeo-Christian canopy. In fact, many American teenagers cannot even NAME Buddhism or Hinduism when asked to name the major religions of the world. And understanding of Islam is poor at best, even among America's political leaders. Morehead's Musings: To what do you attribute this religious illiteracy historically? Stephen Prothero: I have two chapters on this in Religious Literacy, so it's hard to summarize all that here. Suffice it to say that the Religious Right is wrong to pin this downturn to secularists and to trace it to the 1962 and 1963 Supreme Court rulings against prayer and devotional Bible reading in public schools. For the most part it was religious people, and evangelicals especially, who pushed the Bible out of public schools, and they did so in the middle of the nineteenth century. Moreover, churches have done a very, very poor job teaching the basic stories and doctrines of Christianity. For the last century and a half or so they have been focused far more on loving Jesus than on understanding him, and on feeling their way into religion rather than thinking their way in. Morehead's Musings: In an article you did for Beliefnet you noted that former Secretary of State Madeleine Albright had a large number of official economic experts to assist here, but only one informal expert on religion. This is a staggering fact! What types of ramifications do you see for this lack of awareness of the religions, whether in the political sphere on a national or international basis, or whether between neighbors of differing religions in America? Stephen Prothero: Well, this is a scandal. The only reason it makes ANY sense is if religion doesn't matter. But of course it does. If we want to understand what moves people overseas to act politically and economically and militarily then we need to understand religion, because in many cases religious beliefs and practices are key motivators for these behaviors. And in many cases religion is a more powerful motivator than grasping after power or after money. It sounds self-serving, but I don't see why the Secretary of State shouldn't have an advisor concerning every major world religion at her fingertips. Can we really understand what is happening in China or North Korea without understanding Confucianism, for example? Or the strife in Sri Lanka without understanding Buddhism and Islam? Morehead's Musings: What have you suggested as a remedy for this situation within the boundaries of the separation of church and state? Stephen Prothero: I think we need mandatory religious studies courses in our public schools. One on the Bible--what it says and how it has been used over the centuries, in art, literature, and above all American politics. And another on the great religions of the world. The U.S. Supreme Court has made it plain that such courses are not only constitutional but necessary, as long as the subject of religion is being TAUGHT rather than being PREACHED. Morehead's Musings: It appears that most seminaries and Christian universities have yet to make courses in world religions, new religions, or intercultural studies a required part of training for future pastors and Christian ministers. Might not the religious diversity America's neighborhoods and our current religious illiteracy indicate a change is needed in theological education in this area? Stephen Prothero: This is a great point. I wish I had taken it up more fully in Religious Literacy. Of course there are seminaries that do reckon with some care to the religions of the world. At Boston University's School of Theology there is a "Core Texts" course that covers the scriptures of the great religions. But such courses are typical only at the more liberal seminaries. I have to say, however, that seminaries aren't doing a good job teaching their graduates about Christianity, much less Daoism and Jainism. Many Lutheran seminarians know next to nothing about Luther and many Methodist seminaries know even less about the Wesleys. Morehead's Musings: Also in your beliefnet article I referenced previously, you suggest that not only should the general American population have a greater religious literacy, but that we should expect this of our presidency. While much of the controversy in religion and politics recently has surrounded Mitt Romney and his Mormon faith, you suggest that we move beyond this and ask the broader questions. How might we be thinking more strategically about how religious and cultural literacy impacts (or should impact) our foreign policy and how this in turn impacts what we should be looking for our our presidential candidates? Stephen Prothero: My point in this Beliefnet piece is that we should have a "religious test" for the U.S. presidency. Not the sort of test outlawed in the Constitution ("Are you a Christian?") but the sort of test included in my "Religious Literacy" book. Before I am going to vote for any politician for president I want to know if they can tell a Sunni from Shiite. So my point about Governor Romney was this: I don't care if he's a Mormon or whether Mormons are really Christians. I want to know what he knows about Hinduism and Islam, and whether he is ready therefore to deal with a crisis, should it come, in Kashmir. Morehead's Musings: Dr. Prothero, thanks again for taking time to answer these questions. I hope that my readers pick up a copy of your book and expand their awareness of the religions. Stephen Prothero: Thank you, John, for bringing my book to the attention of your readers.